The 16th Istanbul Biennial will take place between 14 September and 10 November 2019. It will be curated by French curator, art scholar and writer Nicolas Bourriaud. The Istanbul Biennial Advisory Board members include Iwona Blazwick, Ayşe Erek, İnci Eviner, Yuko Hasegawa and Agustín Pérez Rubio. Nicolas Bourriaud, born in 1965, is a curator and writer. He is the director of Montpellier Contemporain (MoCo), an institution he created, gathering the La Panacée art centre, the Ecole Supérieure des Beaux-Arts and the future MoCo Museum, which will be opened in June 2019. He was the director of the École Nationale Supérieure des Beaux-Arts de Paris from 2011 to 2015. From 2010 to 2011, he headed the studies department at the Ministry of Culture in France. He was Gulbenkian Curator for Contemporary Art at Tate Britain in London from 2007 to 2010 and founder advisor for the Victor Pinchuk Foundation in Kiev. He also founded and co-directed the Palais de Tokyo, Paris between 1999 and 2006. Bourriaud’s recent exhibitions include Crash Test, La Panacée (2018); Back to Mulholland Drive, La Panacée (2017); Wirikuta, MECA Aguascalientes, Mexico (2016); The Great Acceleration / Art in the Anthropocene, Taipei Biennial (2014); The Angel of History, Palais des Beaux-Arts (2013); Monodrome, Athens Biennial (2011) and Altermodern, Tate Triennial, London (2009). 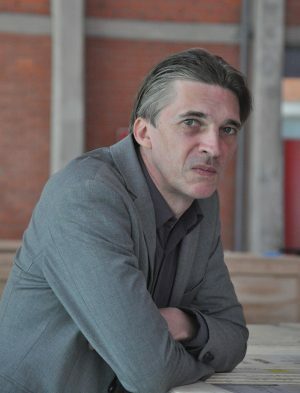 Nicolas Bourriaud was also in the curatorial team of the first and second Moscow Biennials in 2005 and 2007. His selected books are The Exform (Verso, 2016); Radicant (Sternberg Press, 2009); Postproduction (Lukas & Sternberg, 2002); Formes de vie: L’art moderne et l’invention de soi (Denoel, 1999) and Relational Aesthetics (Presses du reel, 1998).